When Teen Magazine folded in 2009, I was 30 years old and the news, somehow, didn’t reach me. This was surprising because, for a time, I lived for Teen. But little sisters are wily and willful, and I needed to know what Teen had to tell me about dating and bodies and lip gloss. So I got my hands on them anyway, somehow. For three straight preteen years I didn’t just skim through those contraband issues; I inhaled them. I memorized them. Teen was my bible. I knew a little something about teen girl culture — years of dance classes, of holding my breath backstage during competitions where the air was a suffocating smog of hairspray, kept me in close proximity to older girls who seemed far more worldly than I could imagine, and my makeup skills were well honed — but something about the way Teen portrayed those upcoming years, with its incessant focus on primping, made me think I needed to be much more prepared. I needed a Caboodle, Lee Jeans, and Love’s Baby Soft. I needed armor. I needed to be a better version of me, and only Teen could guide me there. Be the change you wish to see in the world and all that, so the night before fifth grade I sneaked an issue from Jillian’s closet, hiding it under my shirt as I dashed down the hallway, and closed myself into my bedroom. Miraculously, I managed to do this alone, without prying eyes; no easy feat when you share a bedroom. I skimmed the issue — I just needed a refresher, I had long ago memorized the content — and made a plan. How did teenagers get ready for school, I wondered. How should I? According to Teen, it all had to begin with primping. So I plugged in my Lock-n-Roll curlers; the smell of burning rubber should have tipped off my parents, but no one knocked. Next, I unearthed a goopy peel-off mask from the bathroom (that, too, probably also belonged to Jillian) and layered it on as thick as I could stand. I laid out my clothes for the next day — some flouncy skirt and cropped tee shirt that I would end up regretting, since it turned out P.E. was scheduled for that first day — and tied my hair in those hot rubber knots. I was creating my own back-to-school sleepover, sans the smiling friends I saw in Teen. I was going to be just like those magazine models — mature, shiny and glowing, and ready for the halls of high school. Except…I wasn’t in high school yet. That was the thing I kept forgetting every time I read an issue of Teen. I was still in elementary school, and the world presented to me in each issue — one where girls had pressing questions about their boyfriends, their parents, and their maxi pads, often all in the same breath — wasn’t available to me yet. That night before fifth grade, I remember looking around the bedroom I shared and wondering why I wasn’t hanging out in the living room with my family. Wondering, too, when I’d feel as excited and grown-up as the girls in the magazines, wondering whether all this female conditioning was what being a teenager was all about it. Wondering whether it was worth it. As the minutes ticked by and my face mask refused to dry, I grew tired. Lonely, even. Primping isn’t much fun when you’re doing it in secret, alone. So when my dad knocked on my door and asked me what on earth I was doing, I surrendered. I was going to have to enter fifth grade without glowing skin, pink nails, or soft curls. I washed off the still-sticky mask and joined my family in front of the television, where I read a Babysitter’s Club before turning in to bed. Over that year and the next, I would still sneak Jillian’s Teen issues. But maybe some of their magic was lost to me that night. One night recently my mom mentioned in conversation that the dress she wore to her prom had been on the cover of Cosmopolitan Magazine when she was a teenager. Of course, I Googled it, because I wanted to surprise her with an old copy. (I never found it.) Eventually, though, I ended up on eBay, that haven of nostalgia, and that is how I ended up looking at old magazines. I found Teen, of course, but also Seventeen and Sassy and YM, and I ended up purchasing far too many of them. One by one they arrived in unmarked padded envelopes, like they were some kind of secret. Well, weren’t they? I hadn’t even told my husband that I’d spent nearly triple digits on vintage magazines for no other reason than nostalgia. I didn’t Snapchat them to my friends; I didn’t even post a #tbt on Instagram. For weeks they were my secret shame, but also something that lit me up inside whenever I thought of them. I had to brace myself, I knew. The magazines would unleash a river of memories, and I needed to be prepared. Finally, I was ready. One evening I put my baby to bed, opened up a bottle of wine, and read them cover to cover. Would you be surprised to learn that I remembered damn near every page, including the ads? 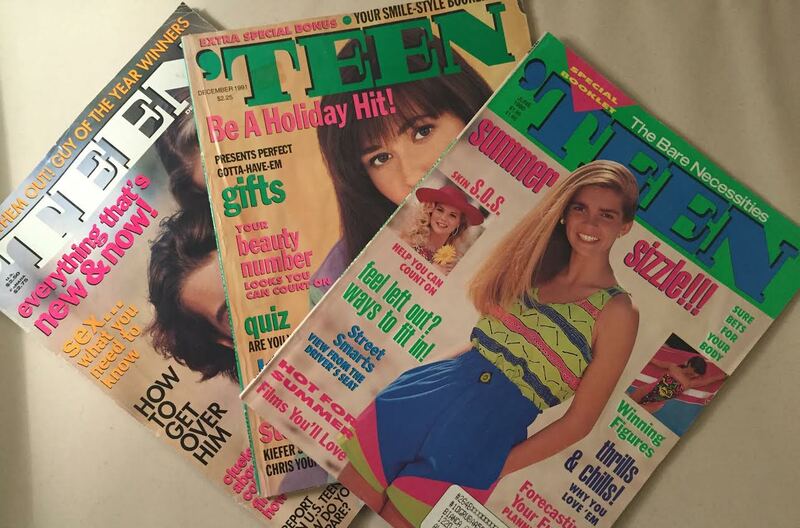 The neon color palettes, the thick brows, the big earrings — reading these magazines was like recovering an old diary, or a time capsule. With each turn of the page I was awash in familiarity, in reconnecting with the sheer joy and curiosity I’d had when I first read them. I saw models whose faces I remembered because I’d studied them so hard as a teenager; advice columns I’d pored over, seeking answers to my own questions; fashion spreads I’d tried to recreate with my friends in an effort to feel the freedom and happiness the girls in the magazines seemed to. I got lost in those old magazines, but I was found in them, too. These days, magazines represent something different to me, something more frivolous: vacations, frozen margaritas on beaches, lazy Sundays on the couch. But back then, Teen and Seventeen and YM and Sassy meant much, much more. They meant discovery and curiosity; they meant adulthood and answers. Those magazines helped me see a world bigger than the one I knew, and I am forever grateful to them.